Well I’ve officially had this blog for about 4 months now, and for about 4 months my family has been begging me to make one of their favorite pastries. 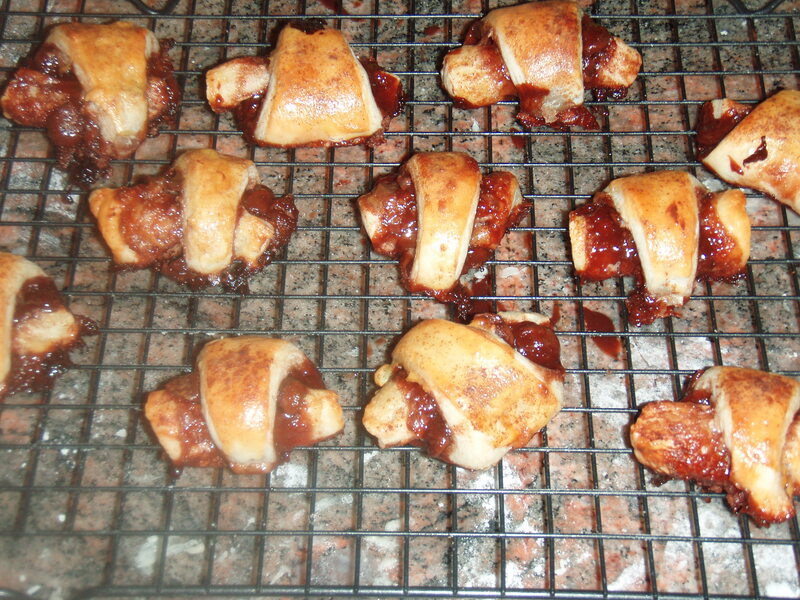 Finally, here it is… My Rugelach! Thanksgiving is one of the biggest holidays my family has. Family members come in from all over, my mom cooks enough food for a small country, we all drink enough to last us at least a week and we attempt a game of football in the front yard which always happens to be in the rain! We have a blast! Last year when I went home I baked a variety of pies, cakes and pastries and one of the treats was my Rugelach. My cousin Ted and his girlfriend Stephanie loved it so much that we all began brainstorming possible names for bakeries that I could open and different ways to promote me. Ted was actually the one to come up with Kristin’s Cravings! Unfortunately, Ted and Stephanie live in NC and can’t enjoy my Rugelach as much as they’d like to so I promised them that the next time I made it, I’d send a tin down to them. This was my first time transporting my pastries by mail, but it worked! They made it to NC in about 3 days (through Hurricane Irene!) and were devoured in less than 24 hours. I like to experiment with my recipes a bit and change them up depending on what tastes I’m in the mood for. 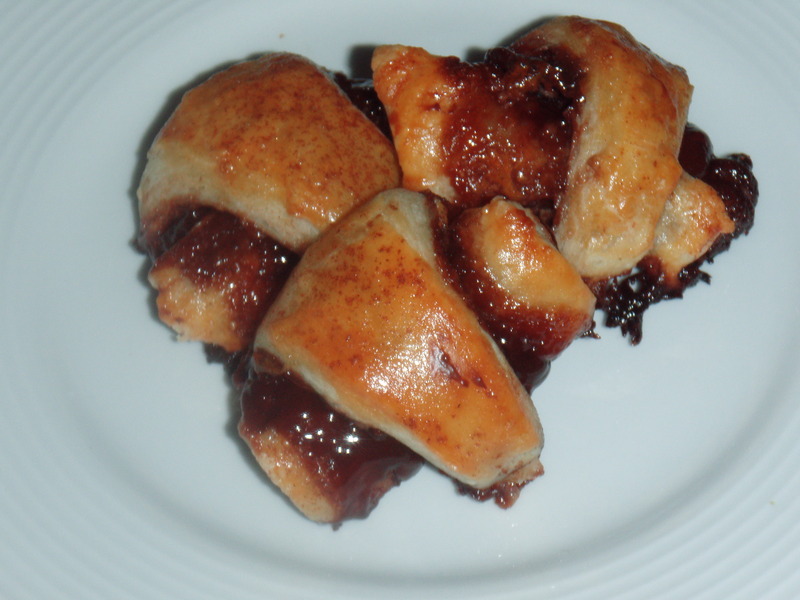 When I found this recipe for Rugelach it called for walnuts and apricot jelly as the filling and a heavy dough. I decided to switch things up and needless to say I’m pretty proud of my creation. What’s also great about this recipe is that it gives you a chance to be creative. Use fillings that jump out to you and change things according to your tastes. So here it is.. The long-awaited Rugelach recipe! In a small bowl, scoop in the Nutella and strawberry jelly. Place the bowl in the microwave and heat for about 30 seconds; stir to combine. If they are not fully combine, place the bowl back in the microwave for another 10-15 seconds. Taste the mixture. If it’s a little too nutty add some more of the jelly and if it’s too sweet add more of the Nutella. This recipe is all about what you like. For the Puff Pastry, this can be found in the freezer section of your supermarket, or made from scratch using my Puff Pastry recipe under the Baking Tips section of the blog. Either method you chose, take the pastry out of the fridge and roll out until is it about 1/8 inch thick. If you made the pastry from scratch you’ll want to cut it in half and only use one half for now. Place the other half back in the fridge. 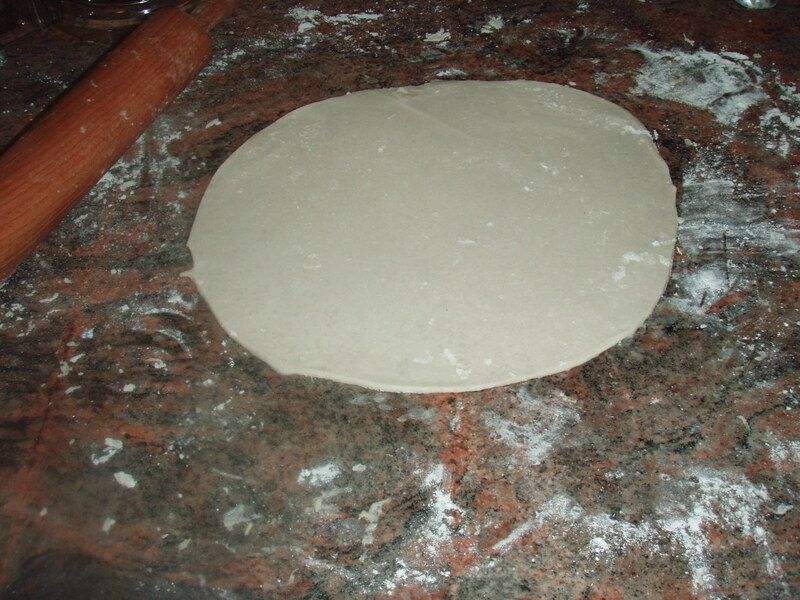 Once the pastry is rolled out, use a knife to cut out a 9-inch circle. Use the Nutella and Jelly mixture you created earlier to spread a layer over the top of the rolled out dough. Be generous! I’ve been told by my ginnie pigs taste testers (aka my family) that they prefer more of the filling. 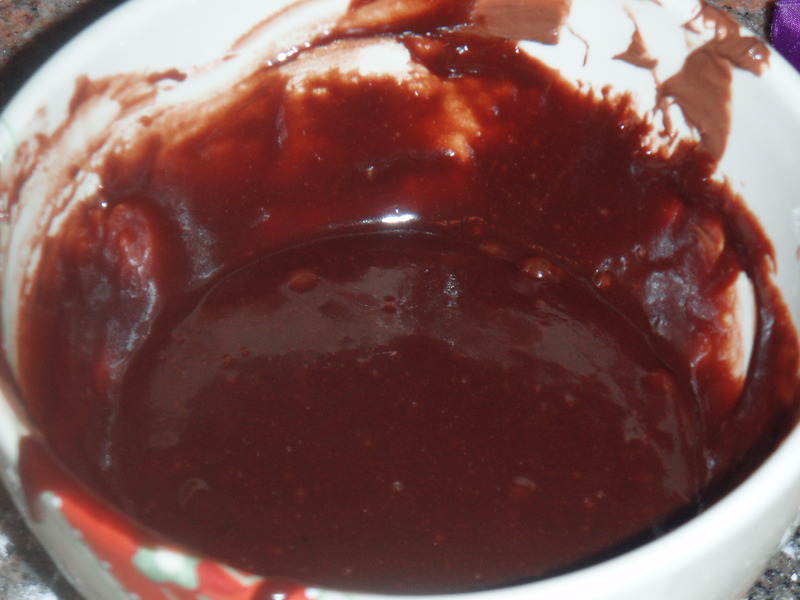 Once the filling is spread, sprinkle plenty of chocolate chips over the top. Keep most of the chips away from the center and more toward the edges to make it easier to roll later on. Using a pizza cutter or a sharp knife, slice the dough like you would a pizza into about 16 equal wedges. Beginning with the outside edge of each wedge, roll up to enclose the filling. This part may get a bit messy, but I’ve always found the messier the better! Place each roll about 1 inch apart on the prepared baking sheet. Repeat with the remaining wedges. Once all the dough is rolled and placed on the baking sheet, lightly beat an egg; brush over the tops of each roll and sprinkle with granulated sugar and cinnamon. Bake the sheet, rotating halfway through, until the rolls are golden brown, about 30 minutes. Transfer to a wire rack and let them cool completely. yum! one of kristin’s best!